The Original Grill Gauge propane measuring device is a must for every gas (propane) grill owner. Never run empty again! The Grill Gauge accurately measures the propane in your tank. No batteries or power source is required. Simply attach the Grill Gauge to your propane tank to get an instant and accurate reading of how much propane is in your tank. 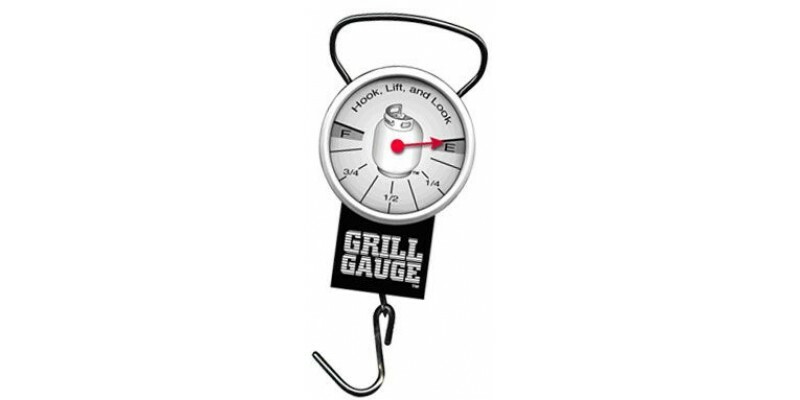 Easy to use, dependable and durable, the Grill Gauge will Never Leave You Guessing! The Grill Gauge is simple to use. Just attach the Grill Gauge to your tank. DISCONNECTING FROM GAS LINE IS NOT REQUIRED TO OPERATE EFFECTIVELY. TANK MUST ONLY BE FREE AND CLEAR OF OBSTRUCTION TO LIFT FROM SURFACE. Lift slightly off ground just until the entire tank has been raised from the surface. View the read out on the gauge. The Original Grill Gauge is rated 4.9 out of 5 by 10. Rated 4 out of 5 by Reelane from Grill Gauge for propane cans.. The grill gauge works great on 20lb. propane cans.The problem is I did not see a mention on the site it is ONLY FOR 20lb. propane cans. It will not weigh a 30lb. propane can. My problem is all our propane cans are the bigger cans. It weighs the bigger cans at half full when they are empty. So, for me it is usless,but I do have one 20lb. propane can the gauge can be use on. Rated 5 out of 5 by Kevin Murphy from Guage is spot-on accurate I bought the Grill Gauge last month and for something so simple it works so well. Two years ago I wasted my money on a pressure-type gauge and it was very inconsistent. The Grill Gauge is "spot-on" and works like the manufacturer says. I'm giving one for my Dad this Father's Day. Thanks Grill Gauge! Rated 5 out of 5 by Cass from Don't use warm water - This is easier Hey George, why go to all the bother of heating up a glass of warm water when this is so quick and simple to use, for the price of the Grill Gauge you will pay a lot more for propane to heat up your glass of warm water, just as well spend that money on a Grill Guage don't you think? Rated 5 out of 5 by Will Tophinger from Consistent and reliable It worls like a charm! It is consistent and reliable each time I've used, and because it is portable, I take to the propane exchange location to make sure I'm getting all the propane I'm paying for! The Grill Gauge is so simple, yet so effective. I have also bought one for my Dad. Rated 5 out of 5 by George from Same thing as a warm glass of water I was wondering why any one would buy one of these when it is so easy to tell your gas level with a glass of warm water.I haven't bought one but had to rate it to submit comment. Rated 5 out of 5 by Brian from Ordered more for gifts I ordered one with my expedition 3, and couldnt beleive how well it worked. So simple and easy to use, wish I would have thought of it I just ordered 2 more for gifts. Rated 5 out of 5 by Aaron from Simple propane gauge a home run! I bought this from a catalog and couldn't believe for so little price something would really work this good. I'm a believer - works fast and tells the truth! Rated 5 out of 5 by Garrett from A propane scale that works! I've tried other propane scales or gauges and they're either unreliable or don't work after a few uses. This works all the time. I trust it!